Quarantine officers in August inspect the ship Alpha Friendship, a bulk carrier registered in Greece that carries ore from Port Pepel in Sierra Leone, one of the Ebola-hit countries in West Africa. 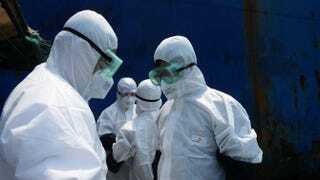 In what is being called one of the most sweeping lockdowns against a contagion since the Middle Ages, Sierra Leone on Friday began confining an estimated 6 million people to their homes in hopes of stopping the spread of Ebola in the West African nation, USA Today reports. During the lockdown, thousands of health workers are going house to house in crowded urban neighborhoods and remote villages, hoping to find and isolate infected people, the report says. President Ernest Bai Koroma implored residents to cooperate. “The survival and dignity of each and every Sierra Leonean is at stake," he said Thursday night in an address to the nation, according to the news site. Health officials said they planned to urge the sick to leave their homes and seek treatment, USA Today reports. It was unclear whether people would be forcibly removed, although authorities warned that anyone on the streets without an emergency pass during the lockdown is subject to arrest, the report states. An estimated 2,600 people have died in West Africa over the past nine months in the biggest outbreak of the viral disease ever recorded, with Sierra Leone accounting for more than 560 of those deaths, USA Today says. The disease could continue to spread, the report says, in part because sick people afraid of dying at treatment centers are hiding at home, potentially infecting others.